You will be thrilled to be in the dog house every year with this one of a kind Cocker Spaniel Personalized Dog House Christmas Ornament. Personalize-It-Yourself with your best friend's name and make it a cherished holiday tradition. Made of the finest Hand Painted Stone Resin and standing at 1.5" x 2.375". Give the gift that will last a lifetime to everyone on your list this holiday season. You will be thrilled to be in the dog house every year with this one of a kind Cocker Spaniel Personalized Dog House Christmas Ornament Black. Personalize-It-Yourself with your best friend's name and make it a cherished holiday tradition. Made of the finest Hand Painted Stone Resin and standing at 1.5" x 2.375". Give the gift that will last a lifetime to everyone on your list this holiday season. 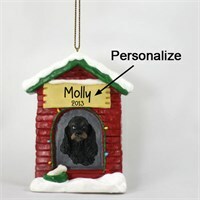 You will be thrilled to be in the dog house every year with this one of a kind Cocker Spaniel Personalized Dog House Christmas Ornament Black-Tan. Personalize-It-Yourself with your best friend's name and make it a cherished holiday tradition. Made of the finest Hand Painted Stone Resin and standing at 1.5" x 2.375". Give the gift that will last a lifetime to everyone on your list this holiday season. You will be thrilled to be in the dog house every year with this one of a kind Cocker Spaniel Personalized Dog House Christmas Ornament Black-White. Personalize-It-Yourself with your best friend's name and make it a cherished holiday tradition. Made of the finest Hand Painted Stone Resin and standing at 1.5" x 2.375". Give the gift that will last a lifetime to everyone on your list this holiday season. 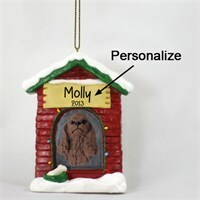 You will be thrilled to be in the dog house every year with this one of a kind Cocker Spaniel Personalized Dog House Christmas Ornament Brown. Personalize-It-Yourself with your best friend's name and make it a cherished holiday tradition. Made of the finest Hand Painted Stone Resin and standing at 1.5" x 2.375". Give the gift that will last a lifetime to everyone on your list this holiday season. 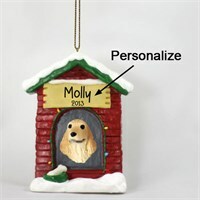 You will be thrilled to be in the dog house every year with this one of a kind Cocker Spaniel Personalized Dog House Christmas Ornament English. Personalize-It-Yourself with your best friend's name and make it a cherished holiday tradition. Made of the finest Hand Painted Stone Resin and standing at 1.5" x 2.375". Give the gift that will last a lifetime to everyone on your list this holiday season. You will be thrilled to be in the dog house every year with this one of a kind Cocker Spaniel Personalized Dog House Christmas Ornament English Black. Personalize-It-Yourself with your best friend's name and make it a cherished holiday tradition. Made of the finest Hand Painted Stone Resin and standing at 1.5" x 2.375". Give the gift that will last a lifetime to everyone on your list this holiday season. 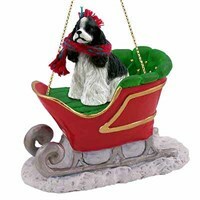 Deck your halls and trim your tree with this sweet and colorful Cocker Spaniel Sleigh Ride Christmas Ornament Black. 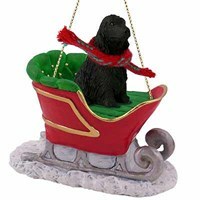 Our Cocker Spaniel Sleigh Ride Christmas Ornament Blacks are crafted from fine quality stone resin and feature a beautiful full color figurine. All of our Christmas ornaments are crafted for a lifetime of memories and make wonderful gifts, and these beautiful Cocker Spaniel Sleigh Ride Christmas Ornament Black are no exception. 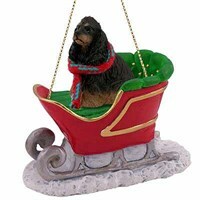 Deck your halls and trim your tree with this sweet and colorful Cocker Spaniel Sleigh Ride Christmas Ornament Black-Tan. Our Cocker Spaniel Sleigh Ride Christmas Ornament Black-Tans are crafted from fine quality stone resin and feature a beautiful full color figurine. All of our Christmas ornaments are crafted for a lifetime of memories and make wonderful gifts, and these beautiful Cocker Spaniel Sleigh Ride Christmas Ornament Black-Tan are no exception. 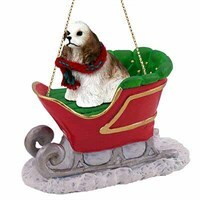 Deck your halls and trim your tree with this sweet and colorful Cocker Spaniel Sleigh Ride Christmas Ornament Black-White. 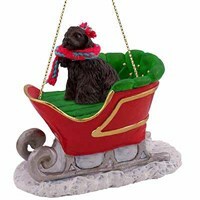 Our Cocker Spaniel Sleigh Ride Christmas Ornament Black-Whites are crafted from fine quality stone resin and feature a beautiful full color figurine. All of our Christmas ornaments are crafted for a lifetime of memories and make wonderful gifts, and these beautiful Cocker Spaniel Sleigh Ride Christmas Ornament Black-White are no exception. Deck your halls and trim your tree with this sweet and colorful Cocker Spaniel Sleigh Ride Christmas Ornament Blonde. 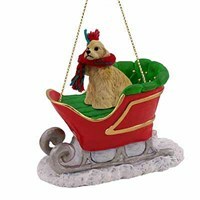 Our Cocker Spaniel Sleigh Ride Christmas Ornament Blondes are crafted from fine quality stone resin and feature a beautiful full color figurine. All of our Christmas ornaments are crafted for a lifetime of memories and make wonderful gifts, and these beautiful Cocker Spaniel Sleigh Ride Christmas Ornament Blonde are no exception. 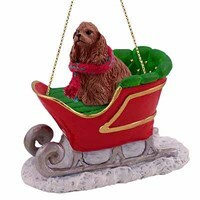 Deck your halls and trim your tree with this sweet and colorful Cocker Spaniel Sleigh Ride Christmas Ornament Brown. Our Cocker Spaniel Sleigh Ride Christmas Ornament Browns are crafted from fine quality stone resin and feature a beautiful full color figurine. All of our Christmas ornaments are crafted for a lifetime of memories and make wonderful gifts, and these beautiful Cocker Spaniel Sleigh Ride Christmas Ornament Brown are no exception. 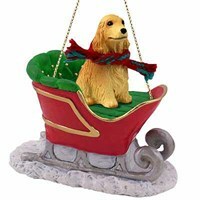 Deck your halls and trim your tree with this sweet and colorful Cocker Spaniel Sleigh Ride Christmas Ornament Brown-White. Our Cocker Spaniel Sleigh Ride Christmas Ornament Brown-Whites are crafted from fine quality stone resin and feature a beautiful full color figurine. All of our Christmas ornaments are crafted for a lifetime of memories and make wonderful gifts, and these beautiful Cocker Spaniel Sleigh Ride Christmas Ornament Brown-White are no exception. 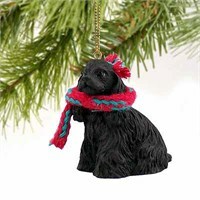 Deck your halls and trim your tree with this sweet and colorful Cocker Spaniel Tiny One Christmas Ornament Black. 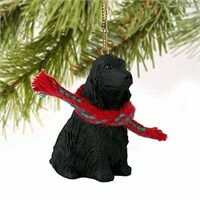 Our Cocker Spaniel Tiny One Christmas Ornament Blacks are crafted from fine quality stone resin and feature a beautiful full color figurine. All of our Christmas ornaments are crafted for a lifetime of memories and make wonderful gifts, and these beautiful Cocker Spaniel Tiny One Christmas Ornament Black are no exception. 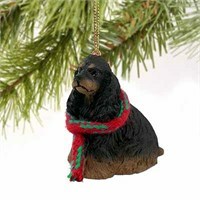 Deck your halls and trim your tree with this sweet and colorful Cocker Spaniel Tiny One Christmas Ornament Black-Tan. Our Cocker Spaniel Tiny One Christmas Ornament Black-Tans are crafted from fine quality stone resin and feature a beautiful full color figurine. All of our Christmas ornaments are crafted for a lifetime of memories and make wonderful gifts, and these beautiful Cocker Spaniel Tiny One Christmas Ornament Black-Tan are no exception. 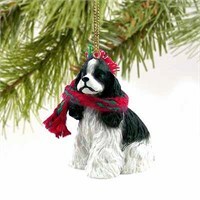 Deck your halls and trim your tree with this sweet and colorful Cocker Spaniel Tiny One Christmas Ornament Black-White. Our Cocker Spaniel Tiny One Christmas Ornament Black-Whites are crafted from fine quality stone resin and feature a beautiful full color figurine. All of our Christmas ornaments are crafted for a lifetime of memories and make wonderful gifts, and these beautiful Cocker Spaniel Tiny One Christmas Ornament Black-White are no exception. 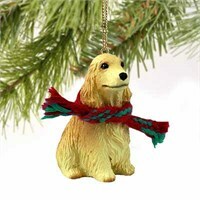 Deck your halls and trim your tree with this sweet and colorful Cocker Spaniel Tiny One Christmas Ornament Blonde. Our Cocker Spaniel Tiny One Christmas Ornament Blondes are crafted from fine quality stone resin and feature a beautiful full color figurine. All of our Christmas ornaments are crafted for a lifetime of memories and make wonderful gifts, and these beautiful Cocker Spaniel Tiny One Christmas Ornament Blonde are no exception.